I grow P. rosettifolia for some years now, but it is puzzling to me. First I had difficulties with propagation, I noticed that the leaves rot very easily and you have to keep them rather dry, after that, it is no problem (just 1 plant per leaf seems to be the rule, not many as with violets). But now I can grow them, and propagate them, and they look nice and healthy, but they never flower. I gave some away, which flowered a few weeks later! Clearly, they miss some kind of trigger, like a change in temperature or so. I tried putting one outside for some weeks last year, it survived (with some sunburn), but it didn't flower. (I have really cold nights, right now it gets to 10 degrees, even when the daytime temperature is 25-30 degrees). My P. rosettifolia during 3 year never flowered but P. barbata, P. flaccida, P. forrestii, P. Momo, HT-2 flowered every year. Maybe need more light for her. And this are my leaves, received from Paul from Slovenia (thanks again). They now have bigger babies. But I am just happy that they are alive. Eventually the leaf will die, you don't have to separate them as there is usually only one plantlet on each leaf. So they will not be in the way of each other like violet plantlets. I will remember your advice, Paul. Now the babies a little bit bigger. Mine is developping flower buds!! How much it took, form leaves to flowers? Or from baby to flower? I got it as a baby in August as I remember. So It is 3 months. I grow it under artificial light. My little babies from the leaves in upper pictures are doing well. Hope they will bloom in a year...or maybe quicker. 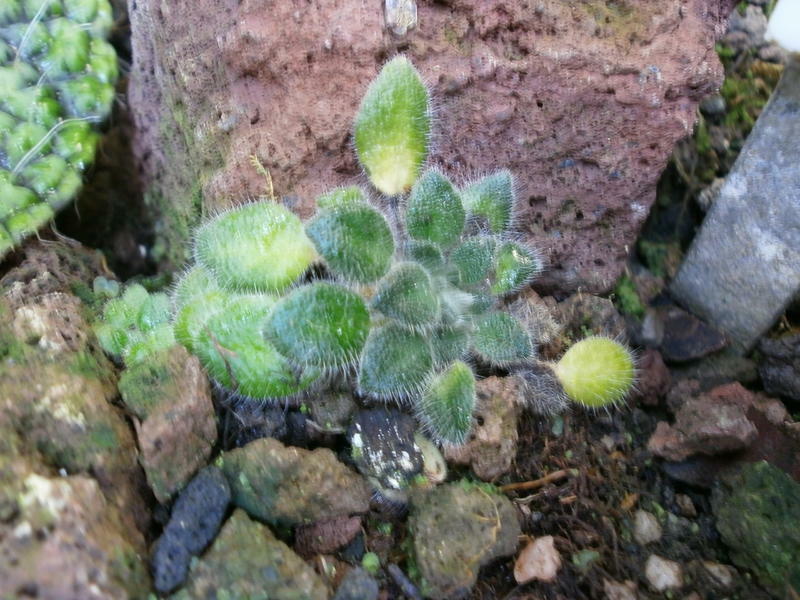 Here petrocosmea rosettifolia is growing at Munich Botanical Garden.